This new year's eve Mr G, myself & Co decided to have a quieter night at home and enjoy the fireworks in Pyrmont. For many years we've endured NYE nights of overdressing, overpriced food and drinks, avoiding intoxicated fools and trying to walk the street in high heels (me not Mr G!) till the wee hours seeking a cab home. As I sat there chilling out watching a few Mad about You episodes that morning I realised I still wanted create some indulgence for us as we said goodbye to 2011 and hello to 2012. For any decent NYE celebrations you not only need some French bubbles but it's also a must to serve a delectable cocktail or few! Being summer here our greengrocer's abound with beautiful sweet seedless watermelons ...... just add a little mint, fresh lime juice, a dash of pomegranate juice and a good lug of Belverdere vodka and you've got a smashing a start to the night. Though when you decide to make cocktails probably a good idea to first check you have a cocktail shaker! Which Mr G's kitchen does not. With a little improvisation I used a coffee plunger It makes a perfect cocktail implement allowing me to create some cocktail wonder. Thankfully Mr G's plunger is still in a box as he prefers a large cappuccino from his local cafe thank making plunger coffee however if using a well used plunger make sure it is well cleaned and dried to ensure no coffee flavours infiltrate your cocktail....unless your making espresso or chocolate martini's! Though NYE can't just be a liquid only evening, I had to create New Year's dinner too. So we could enjoy the Sydney firework's spectacular I decided to have our first course before the 9am fireworks and then follow up with the final course just before the final countdown to the midnight fireworks. Being so close to the Sydney Fish Markets I had to include seafood so off I went to Claudio's to see what divine sea creatures abounded. 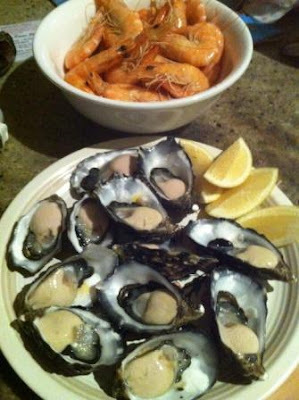 What took my fancy were some deliciously sweet Crystal Bay King prawns, plump and creamy St Helen's Oysters, from Tasmania, and bountiful baby octopus. With such superb fresh prawns and oysters it would be sacrilege to serve them any other way than au naturale....though perhaps with just a squeeze of fresh lemon! Yet for the baby octopus I had other plans. I've been inspired with the flavours of Spain recently so I decided to infuse them with smoked paprika, cumin, coriander, saffron and a little kick of chilli and then toss with lemon vinaigrette, olives and parsley. A good chargrilled steak is Mr G's favourite and so would have the centerpiece of the second course. As I wandered around the local market I came across the Spring Hill grass fed Angus beef sirloin steaks rich deep brown red with loads of marbling that deliver the most delectable, full flavoured and tender steak. If doing steak then you need crisp potatoes and what better than quintessential Spanish style potatoes. Mr G and I have a favourite little Spanish tapas restaurant Miro in the Spanish Quater of Sydney who make a divine twist Patatas Mas Que Bravas ....crisp potatoes smothered in the most wicked spicy, smoky & garlicky tomato sauce. Playing with my food memory I aimed to recreate this with some good quality tomato passata, garlic, smoked paprika and dried chilli. To add a little greenery to the meal I wanted a broad bean salad. The fresh broad bean season has now finished but frozen ones are a great substitute. Just remember to blanch them first and remove that tough outer skin otherwise its like eating tough old boots. Toss your bright green broad beans with some fennel, baby spinach, cos and a vinaigrette though if you wanted something hot pan fry them in some extra virgin olive oil, crushed garlic, marinated artichokes then crumble over some marinated goats cheese or cook them tossed with a little butter, lemon zest, pepper and freshly shaved machengo cheese! Mmm so much for that quiet night in....but then Mr G & Co wouldn't have expected anything less from this little miss foodie! Hope you enjoy the recipes and that you also had an amazing New Years Eve. Happy New Year to you all. May 2012 bring you lots of cooking creations and culinary explorations! 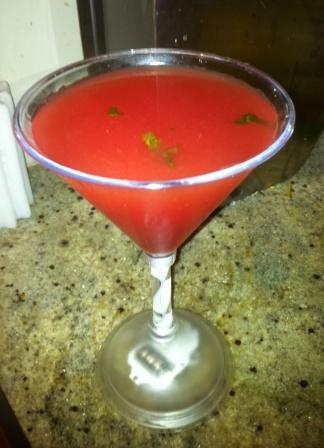 Place the watermelon in a blender and process until pureed. Strain through a fine mesh strainer, reserving juice. Discard pulp. Transfer juice to a clean dry bottle or jar and place in the fridge to chill. Place the watermelon juice, sugar syrup, lime juice, pomegranate juice, mint leaves, vodka and ice cubes in large 12 cup coffee plunger. Plunge up and down for a 1-2 minutes until combined. Pour into martini glasses. Serve immediately. * To make the sugar syrup combine 500g white sugar with 300mls water in a saucepan. Stir over low heat until sugar dissolves. Bring to the boil, without stirring. Remove from heat. Set aside to cool slightly. Transfer to a heatproof jug or bowl. Set aside to cool slightly. Place in the fridge to cool completely. 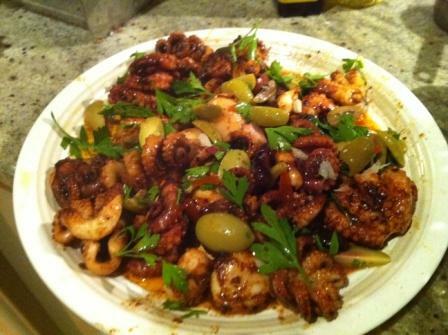 Combine octopus paprika, cumin, coriander, chilli and saffron in a large bowl. Pour over half the olive oil. Toss to combine. Season with salt and pepper. Cover with cling wrap and place in the fridge for 30 minutes to marinate. Heat a large non-stick frying pan over high heat. Add half the octopus mixture and cook, stirring, for 3 minutes or until seared all over and just cooked through. Transfer to a bowl. Repeat with remaining octopus. Combine remaining olive oil, lemon juice, olives and parsley in a bowl. Pour over octopus. Toss to combine. Serve. Combine steak, thyme, rosemary, garlic and olive oil in a large bowl. Season well with freshly ground black pepper. Place in the fridge and marinate for 1 hour. Remove and let steaks come back to room temperature. Season both sides of steak with sea salt. Meanwhile heat a chargrill plate or barbecue over high heat. Place steak fat side down, cook for 2 minutes or until lightly charred. Place meat side down and cook for for 2-3 minutes each side for medium rare or until cooked to your liking. Transfer to a plate. Cover loosely with foil and set aside for 5- 10 minutes to rest. Serve as whole steaks or thinly slice across the grain and serve on a plate sprinkled with chopped continental parsley and extra chopped fresh thyme and rosemary leaves. Place potatoes in a saucepan. Cover with cold water. Bring to the boil. Reduce heat to medium. Season with salt. Cook for 8 minutes or until just tender. Drain. Rinse with cold water. Drain. Set aside for 5 minutes to cool slightly. Cut into half (if potatoes are a little large quarter them). Heat oil in a large frying pan over medium high heat. Add potatoes and cook, stirring, for 5 minutes or until crisp and golden. Transfer to a bowl. Cover to keep warm. Add passata , vinegar, garlic, chilli and paprika. Reduce heat to medium. Cook, stirring occasionally for 5 minutes. Pour over potatoes. Gently toss to just combine. Place broad beans in a saucepan of salted boiling water. Cook for 2 minutes. Drain. Rinse with cold water. Drain. Remove skins and discard. Place beans in a large bowl. Add baby spinach, cos lettuce, and fennel to the broad beans. Combine oil, vinegar and lemon juice in a jug. Season with salt and pepper. Pour over broad bean mixture. Toss to combine.